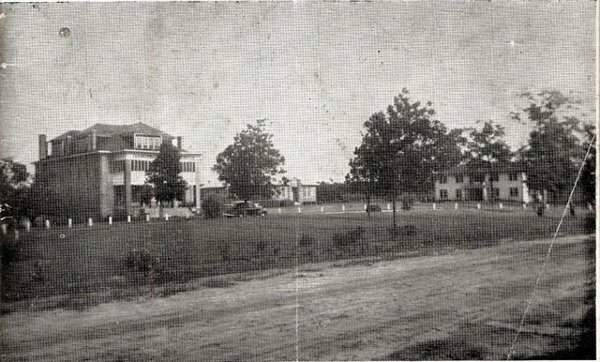 At the first annual session of the North Carolina Convention of Original Free Will Baptists in 1913, a proposal to establish an orphanage was adopted. During the next two years, possible sites for the location of this facility were discussed. An Orphanage Committee was formed in 1914, and it became the board of trustees for the orphanage in 1915. The board later received a gift of 50 acres of land with a few farm buildings on it from Ben B. Deans of Middlesex. By the end of 1916 construction of the first building, a three-story structure with a full basement, had begun. In 1920 the orphanage was ready to receive its first children, and on 23 May four children from one family were admitted. During the early decades of operation, most children admitted were either orphans or had only one parent. While the staff endeavored to meet the children's physical and emotional needs and to provide religious training, local physicians provided medical care without charge. The years of the Great Depression in the 1930s were especially difficult times for the staff and the children at the orphanage since they depended upon the generosity of churches and individuals for financial support. During the 1940s better times arrived, and by 1944 the institution had acquired a total of 361 acres of land, much of it suited for agricultural use. Both boys and girls were assigned tasks to perform, either on the farm or around the household. In 1947 there were 90 children being served by the institution, which was by that time known as the Children's Home. Following World War II, construction of a new chapel was begun, and during the 1950s other buildings were erected to meet the growing needs of the home. Repairs and replacement of old buildings continued during the 1960s and 1970s as the home adapted to cottage-style living with house parents in order to provide an atmosphere that was more like that of a real family. Greater emphasis was placed on counseling parents of children placed at the home, many of whom came from broken or dysfunctional families. A tutorial program was established to help disadvantaged students succeed in school, and a Preparation for Adult Living program was begun in 1983 to assist adolescents in acquiring the skills needed to function successfully in society once they left the home. After much delay in planning, a physical education facility was completed at the home in 1987. On 18 May 1995, the Free Will Baptist Children's Home celebrated its seventy-fifth anniversary with a luncheon served to hundreds of patrons and supporters, followed by a Founders' Day program. The home has served more than 1,800 children in residential care since it opened at its location near Middlesex in 1920. It is supported by the approximately 250 Free Will Baptist churches in North Carolina, most of which are in the eastern part of the state. Michael R. Pelt, A History of Original Free Will Baptists (1996). Free Will Baptist Children's Home opened on May 23, 1920. Image courtesy of Free Will Baptist Press. Available from http://www.fwbpress.com/tfwb/may-2012/celebrating-92-years (accessed June 8, 2012). 1 January 2006 | Pelt, Michael R.
Are there any projects or any needs that a church group can do to help ? Thank you for visiting NCpedia. Unfortunately, NCpedia does not have this information. NCpedia is the online encyclopedia of North Carolina. You may want to contact the Baptist Children's Home organization with this question. Here is a link to their website -- http://bchfamily.org/. I hope this helps! Please let me know if I can help you locate any additional North Carolina information. Thank you for visiting NCpedia. Unfortunately, NCpedia does not have this information. I'm including the link to the "contact" page for the Free Will Baptist Children's Home website http://www.fwbchildrenshome.org/#!contact/c7qk. And here is a link to the "President's Message" page - http://www.fwbchildrenshome.org/#!presidents-message/c1w7y. According to this page, the president is Gary Lee. Hi I was looking for the home my daddy was in in 1945,he is deceased now , His name was willis o. warren and his sister was also in there with him, Rose warren, If he was in there I was wonder do you have any information on them? Thank you for visiting NCpedia and taking a moment to ask your question. By email, I'm going to connect you with Reference Services at the N.C. Government & Heritage Library. Reference Librarians may be able to help suggest some resources that might help you investigate this. I have found info about the children's homes. Are there adult care homes for special needs adults in NC? You may want to contact the North Carolina Department of Health and Human Services. They would probably be the best resource to help you locate this information. Their web page for People with Disabilities can be found at http://www.ncdhhs.gov/disabilities/. And their contact information can be found at http://www.ncdhhs.gov/contacts/index.htm.